There is something uniquely American about hitch hiking across the country or painting a big bus and touring all over the US. A new mapping project has chronicled famous literary road-trips from authors such as F. Scott Fitzgerald, Jack Kerouac, Mark Twain and Tom Wolfe. 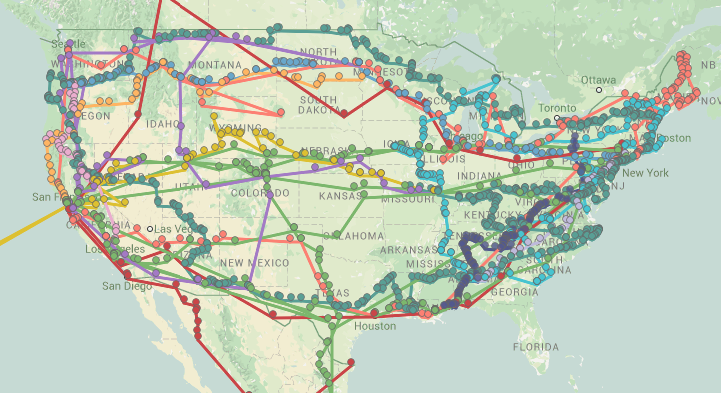 This project was created by Richard Kreitner and Steven Melendez, the map “includes every place-name reference in 12 books about cross-country travel, from Mark Twain’s Roughing It (1872) to Cheryl Strayed’s Wild (2012) and maps the authors’ routes on top of one another.” Each route is peppered with quotations from the book concerned, often with reference to that particular location on the map.